Decimal Games Are A Cool Way For Kids Students To Learn And Practice Decimals. This is the fun place for learning about decimals! You'll find decimal games on this page that will bring a little fun and excitement to learning how to deal with decimals. Decimal Squares: Here's an artsy decimal activity that will let the creativity in kids come out as they learn about decimal, fraction, and percent equivalents. Pairing Decimals to Make 10: This is a fun group decimal activity that helps students practice number bonds to 10 using decimals to one place. Decimal Place Value Chart: Check out tis place value chart to help get a good understanding of how decimals work. Rounding Race: This is a game you can make with your child that will help master rounding with decimals. Decimal Mania: Online Activity to practice Adding and Subtracting Decimals. Decimal Numbers contains a Decimal Point and are based on the number 10. When writing numbers we should know the position (or "place") of each number is important. 2 is in the "Ones Place"
5 is in the "Tens Place"
6 is in the "Hundreds Place"
Click the link for another decimal place value chart and more about decimals. This block is made up of ten small blocks. We will let each of these small blocks represent 0.1 (in decimal format). So from the picture shown, there are three small blocks shaded. So if we want to express the shaded part as a decimal, it would be 0.3. 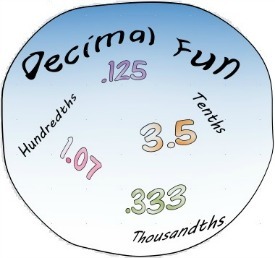 Decimals are a big part of math for elementary and middle school students. They should be comfortable adding, subtracting, multiplying and dividing decimals as they reach those levels.